Used in 3 recipes at an average of 3.0%. 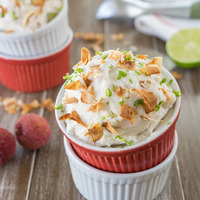 “Heavenly” is really the only adjective I could find to describe this lightly-sweetened homemade coconut milk ice cream infused with fresh lychees, spicy rum notes and lime. RF SC Lychee is the 'queen' of this recipe, it's only supported by a little JF Lychee for a more candied feeling. RF SC Coconut spicy at low volume adds a nice coconut spicy touch to this recipe. The FLV sweet coconut is there to round of and sweeten de ice cream. VBIC needed for the 'bean' taste while LV VIC gives the real ice cream touch. FA lemon Sicily lift the whole mix upwards and sit nice in between the main profile. 1 drop of FLV Ginger would add an Asian touch to the recipe but not many people have this in house i decided NOT to include this in this recipe but if you have this aroma i would recommend to try it! Not sweet enough? add 1 drop of CAP Super Sweet. s/v 24 hours to settle the lychee and 4 days to perfect this vape. Share and rate if you like it.